After fully insulating our van and installing laminate flooring, the next step was to put up the walls. As with every part of the van build process, there are many different options to choose from for walling material. 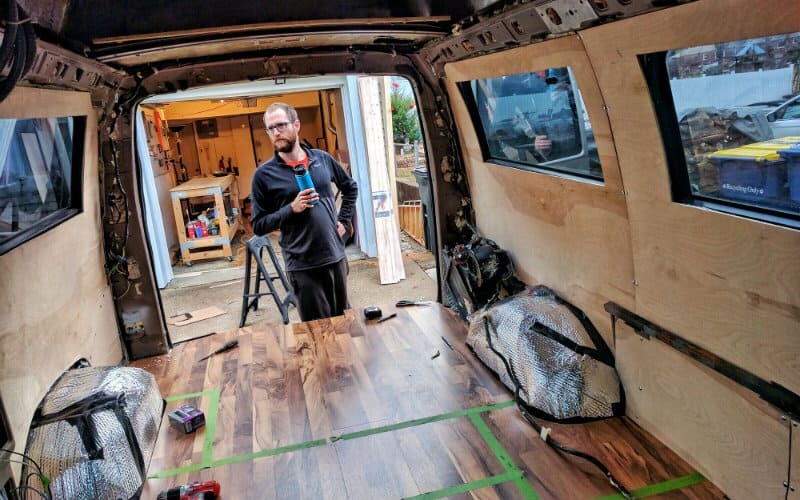 For our van, we decided to go with 1/4” birch plywood because it’s flexible, easy to work with, and has a nice grain pattern. 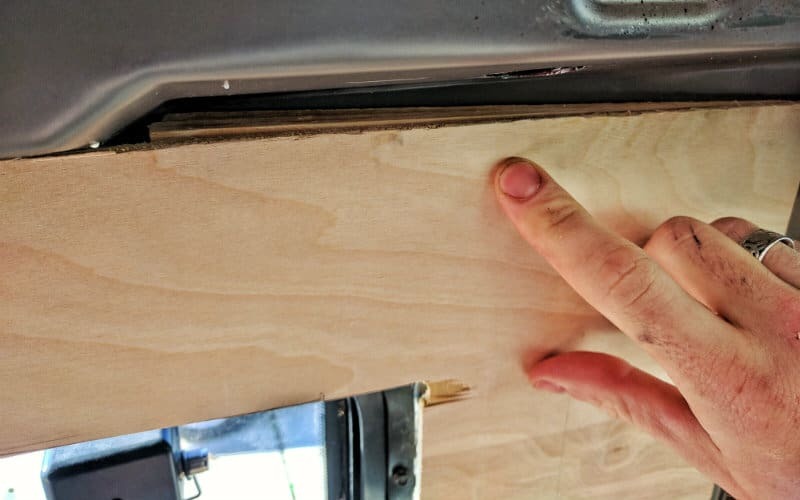 We decided to hang the plywood by screwing it directly to the van’s metal frame. 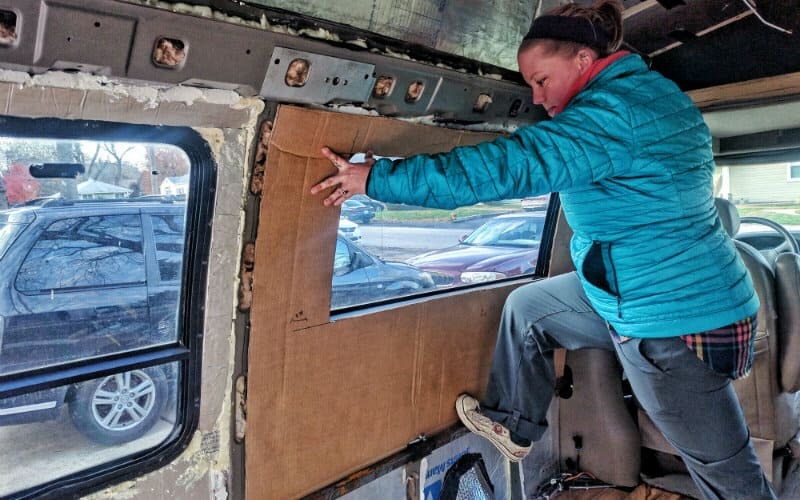 Putting up plywood walls in our van was a little intimidating at first. 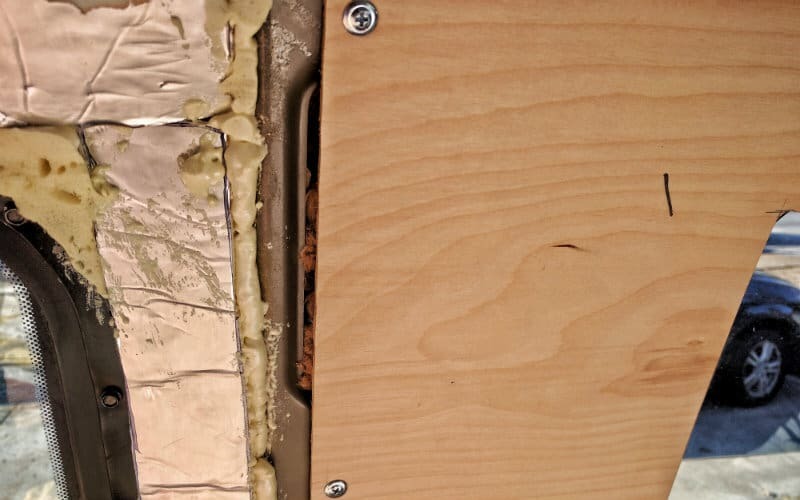 We weren’t sure how the install would work out, if just screwing the plywood to the metal frame would hold it well enough, or how it would look. But once we got on a roll, the walls went up pretty easily and the finished product looks great. Here’s how we did it. 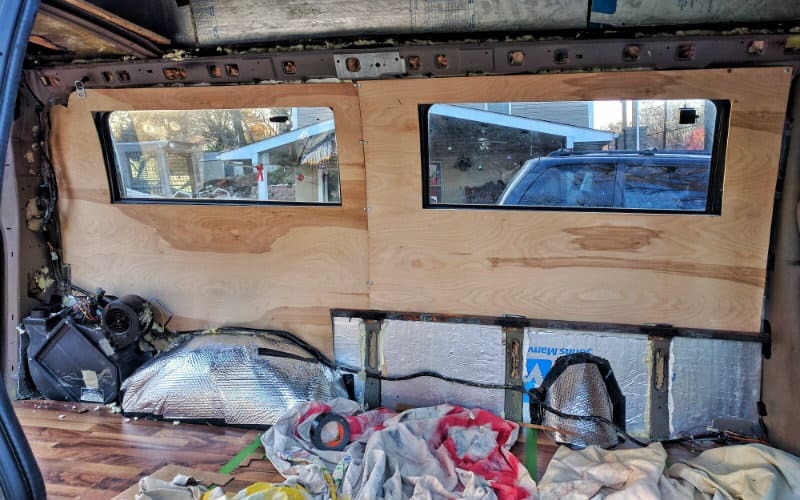 We started by making a cardboard template for the first wall panel, which extended from the metal rib between the two windows on the driver’s side to just behind the driver’s seat. We planned to screw the plywood directly into the metal rib, and wedge it behind the framing by the driver’s seat. 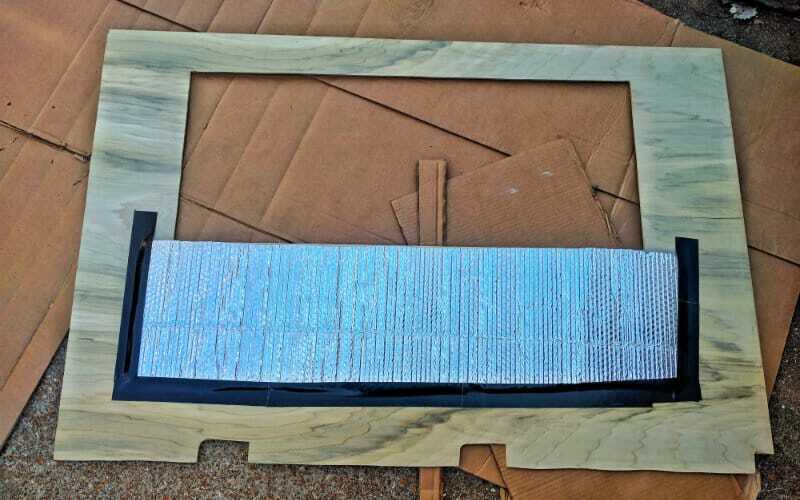 Once we cut out our template we tested it to make sure it fit. We had to trim a few spots here and there to get the sizing as close as possible. As you can see, the panel is blocking out the lower portion of the window. In our furniture design, the kitchen cabinets and the bed platform are higher than the bottom of the windows, so we decided to cover the part blocked by the furniture with plywood and additional insulation. This is the fun part. We traced the template onto a sheet of plywood, then used our jigsaw to cut the outline. 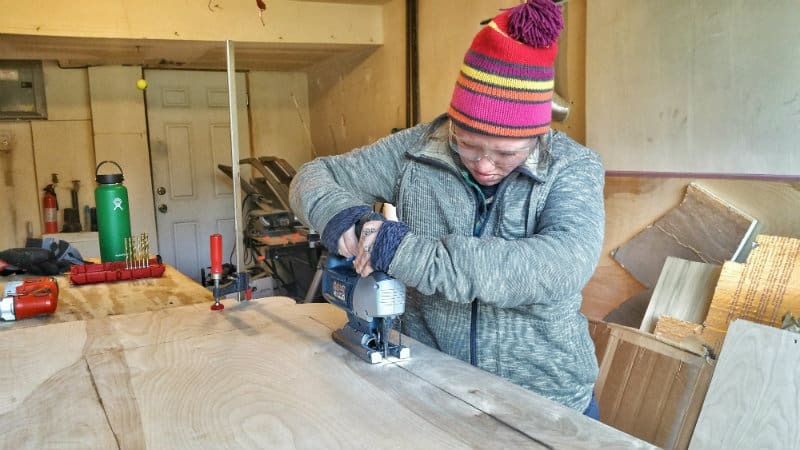 To cut out the holes for the windows, we drilled holes in all four corners using a 1/4″ drill bit, then used the jigsaw to connect the dots. 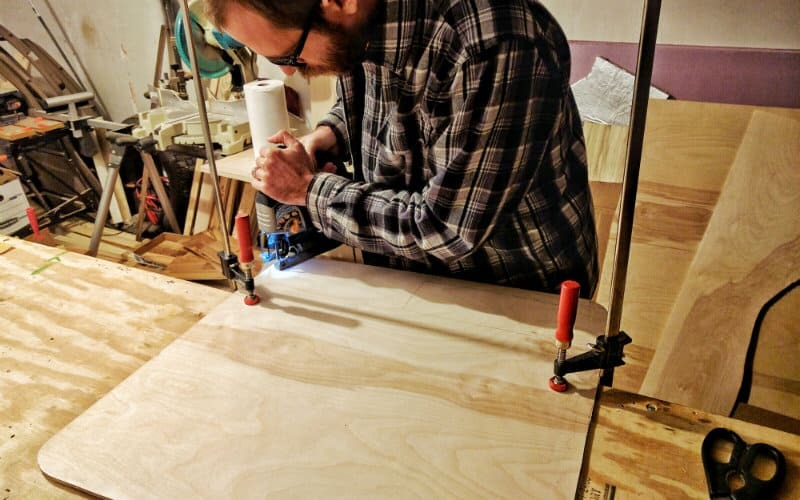 Even though we had tried to get our template as close as possible, we still had to trim down the plywood panel in a few spots to make it fit perfectly. 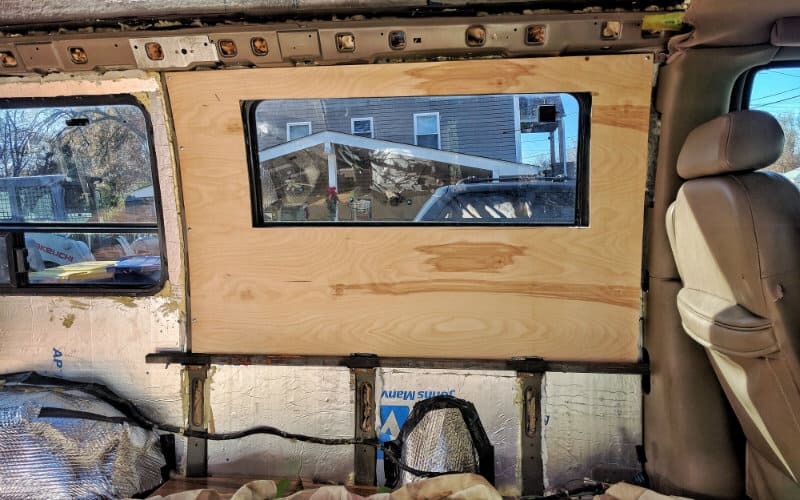 To add insulation to the part of the window that we were covering up, we attached Reflectix to the back of the plywood using 3M High Strength 90 adhesive and Gorilla tape. 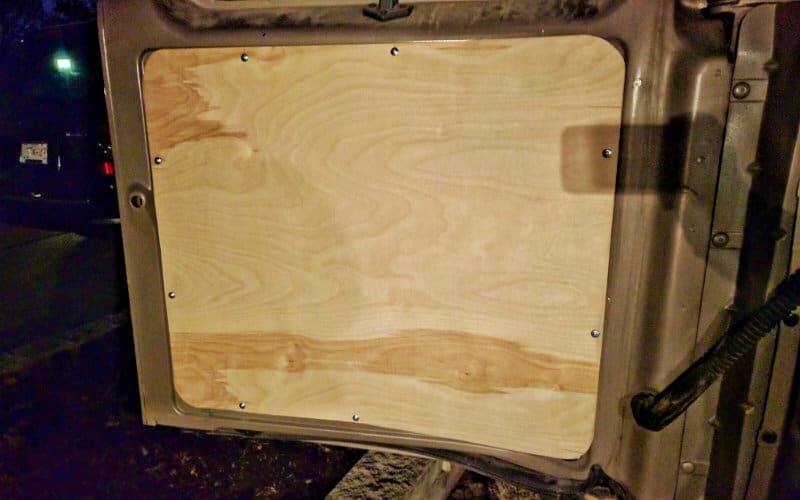 To attach the plywood to our van’s metal framing, we picked up some 3/4” self-tapping sheet metal screws. 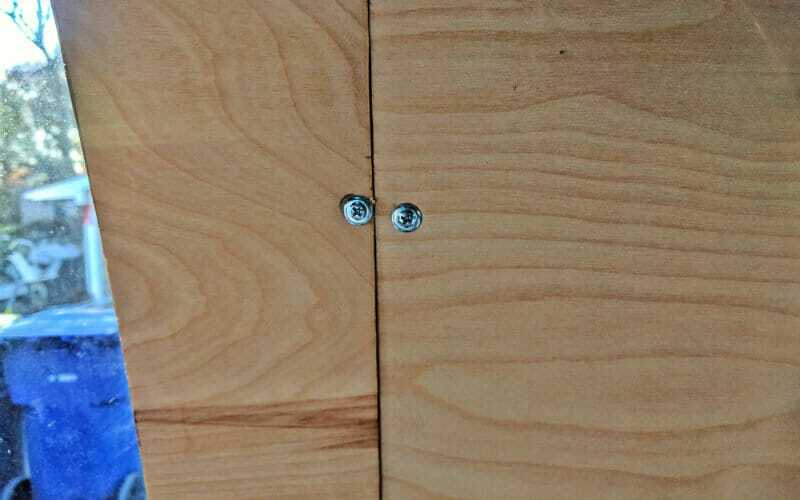 These screws went right through the plywood and into the frame without drilling pilot holes. 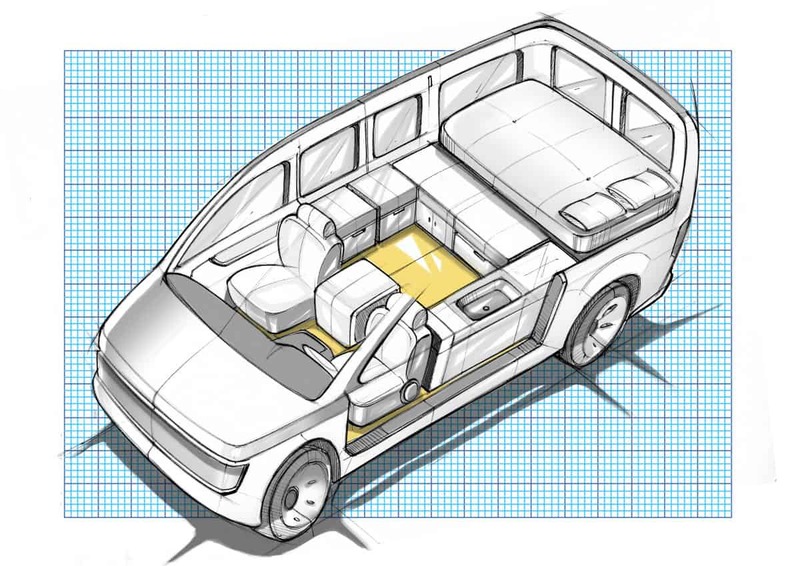 The great thing about 1/4″ plywood is that it’s somewhat flexible, so it will follow the curved contours of a van body. The first panel worked out perfectly. 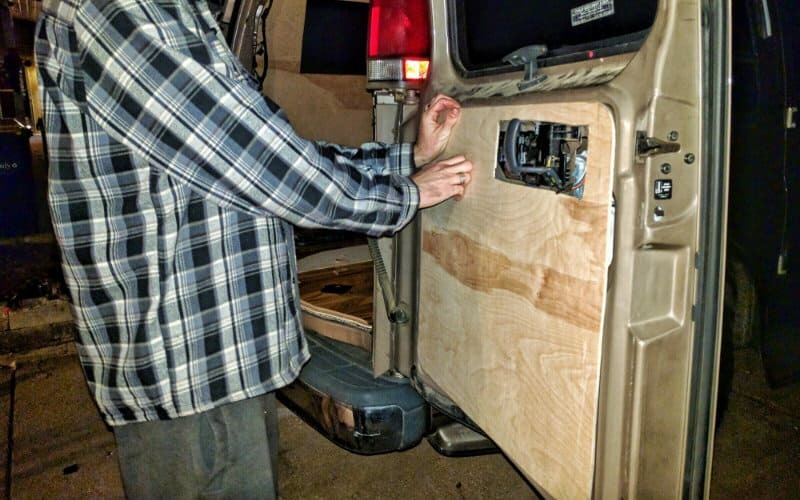 After hanging the first panel, we followed the same steps to cut and hang plywood for the rest of the van. The windows in our van are all the same size, so we were able to modify our first template to make the other two panels. All we needed were a few cuts here and there and an additional piece at the bottom to make the template for the rear windows. Then we traced the template onto the plywood and grabbed our trusty jigsaw. Once we cut and fit the plywood, we screwed it into the metal van frame. We cannot emphasize enough how much time reusing your templates will save you. 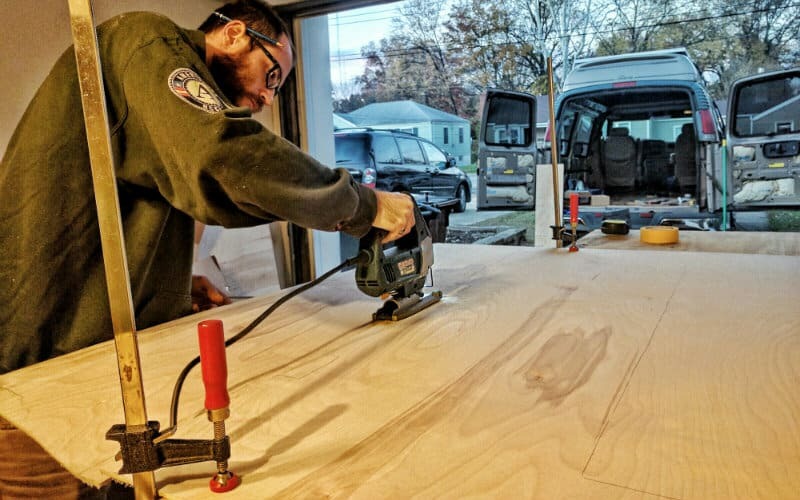 We were able to use many of the same templates in several different steps of our van build. Last but not least was adding plywood panels to the rear doors. If you’ve been following along this far, you can guess how we did this. 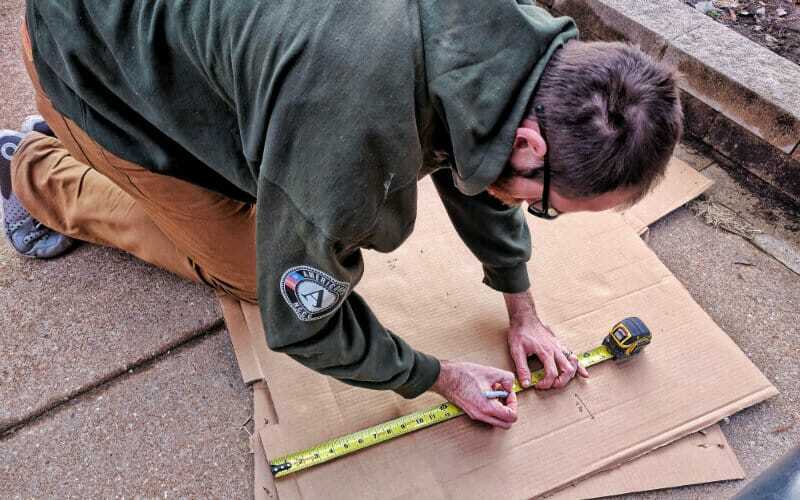 We made cardboard templates, traced them onto plywood, cut them out with a jigsaw, and screwed them into place. We cut holes to accommodate the door handles, and screwed the original plastic handle coverings back over the plywood. Step 10: Admire Your Handiwork! And there you have it! We officially have walls! It’s important to take a step back and applaud your progress after big milestones like this. It wasn’t too long ago that our van was just an empty shell. Now it’s starting to feel more like a home every day. 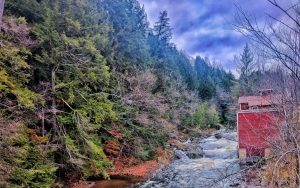 There’s something about the natural beauty of wood covering your living space that makes you feel peaceful and content. That’s why we decided to go with some beautiful cedar paneling for our van’s ceiling. In our next post, we’ll detail how we installed it. We hope you’ve enjoyed keeping up with our progress thus far, and we appreciate all the love and support! You guys rock! Don’t forget to follow us on Instagram @gnomad_home and on Facebook at Gnomad Home. 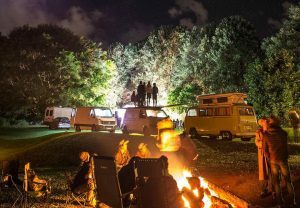 We can’t wait to finish our van build in the next few weeks and finally hit the road. I like the plywood walls and intend to do the same. 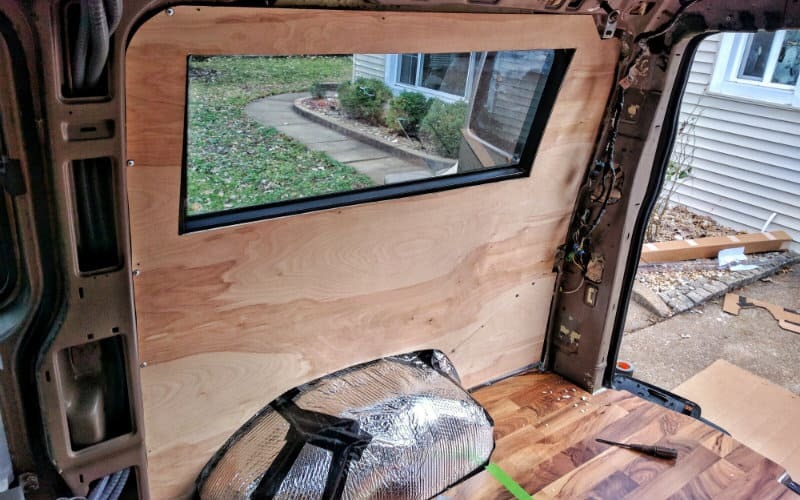 How did you finish or seal the plywood edges that are around the existing windows? I’ll have the same question/situation around my fan, shore power outlet, and floor drain. 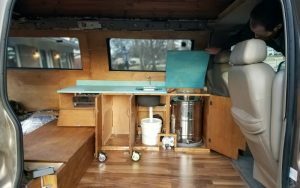 Hi, I’m currently working on my van which is the same type as yours. I was wondering how you went about walling the back of the van? Like yours, mine has the heater motor along with tubes running up the back. I saw your van has walls covering those and was wondering how you went about it? Those clamps are for pipes and with vibration will saw right through the insulation. Using p clamps or cushion clamps is way safer and easier to install. Electrical in a van is like electrical in a boat. It’s not terminated or dressed like house wiring. Look up abyc electrical standards. Great point. When we use the metal clamps like this we actually wrap them in electrical tape to avoid this problem. We will definitely update this to mention that and talk about the downside of using metal clamps for wiring. The insulated clamps are of course purpose-built and better for the application, but they’re not cheap in comparison. Thanks for the thoughts, tips, and kind words! 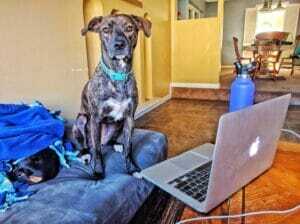 Hi Nicole, thanks for reading! The ribs in our van are only about 3/4” so we didn’t have that issue. You could certainly put up paneling more flush to the walls, but you would probably need to install some sort of studs or nailers to attach it to. Hope that helps! 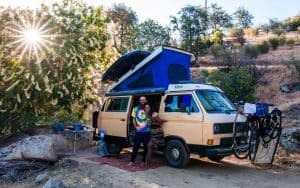 My boyfriend and I are currently doing a build in the same van! Would love to see pictures of yours and hear how it’s going! Hi! 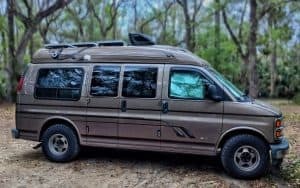 We’re about to put walls up in our 97 dodge ram van and have been following a lot of info on your page (thank you!) In one section your page says you did use birch plywood for the walls and another section says you don’t recommend using it for the walls, to use luan instead. Which one did you use and find worked best for you? Thanks so much for the great info. 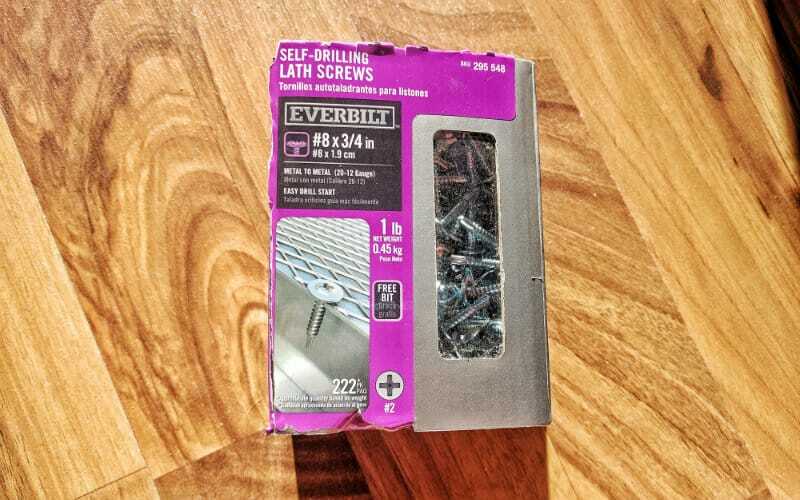 I’m trying to decide whether to use rivnuts or just drill straight into the metal like you did. Your method definitely seems simpler, but others appear to use rivnuts to avoid rust where the metal is cut. Is that a concern? Thanks! Hi Ryan, we have not had any issues with rust where we’ve drilled into our frame (or anywhere else). That said, rivnuts would certainly help your avoid any potential issues. Even if you mount your wall panels with screws rivnuts would be a good option for securing furniture to your vehicle frame. Hope that helps!